Texas' Republican leadership has fought tooth and nail against federal health care reform, adamantly opposed to taking either money or direction from the Obama administration when it comes to providing health care for the poor. But putting politics aside, public health care costs in Texas are rising about $1.3 billionover the next two years, according to one legislative budget estimate. Medicaid enrollment is growing, whether or not the state decides to accept more federal funds to expand the program's coverage to poor adults. And fiscal conservatives are raising the possibility, for first time in recent memory, that state appropriators will this year allocate more money for health care than education. With the Senate’s budget estimate expected to be released Tuesday morning, we take a look at the health care numbers lawmakers will be grappling with for the next four months. 1. Expect less help from the feds. The silver lining here is that the average Texan is on the upswing, with average incomes rising in recent years. But because of that, the feds are asking the state to shoulder more of its own health care costs. The share of Medicaid paid by the federal government is going down, slightly, from 58.05 percent in 2015 to 57.13 percent in 2016. 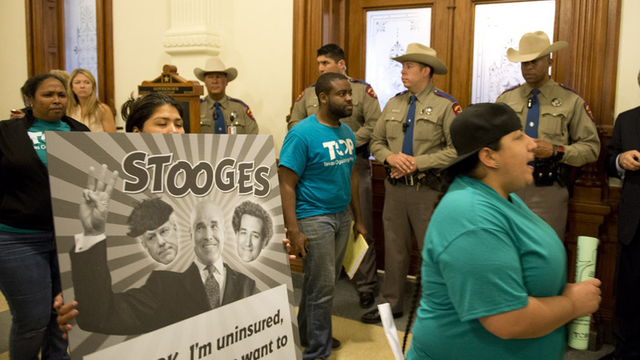 That drop may seem small, but even a slight change to a budget behemoth like Medicaid, which insures about 4.1 million Texans, comes with big fiscal consequences for state lawmakers. The less favorable federal match means Texas will have to pull nearly $750 million more out of state coffers over the next two years just to continue providing the level of care it does now,according to the House budget estimate. That cost, however, will be partly offset by about $300 million in new federal money for certain children in the Medicaid program, made available under the federal health law. Public spending on health care is on the rise in Texas, to the tune of about $1.3 billion over the next two years — and that’s based on an estimate that does not include inflation of health care costs. The main culprit? More Medicaid enrollees. Federal health reform, which mandates that most Americans have health insurance or pay a fine, continues to be a big driver of Medicaid growth because more people are enrolling now who were previously eligible but nonetheless uninsured. State health officials predict the Affordable Care Act will swell Texas Medicaid participation by more than 560,000 people in 2015, including nearly 140,000 adults who were previously eligible. This year, lawmakers will once again consider a form of coverage expansion using Medicaid dollars, a debate expected to be one of this session’s most heated. But even if the conservative Legislature rejects the proposal again, the state’s Medicaid population will continue to grow — and as an entitlement program, lawmakers are on the hook for paying for it. 3. Conservatives are sounding the alarm. Budget hawks, wary of any kind of spending growth, are in dismay about a particular section of the legislative budget estimates: the comparison between health care and education. The state budget pie is divided into sections, and the two biggest slices are health care (Article II) and education (Article III). According to the House’s estimate, the combined federal and state dollars spent on health care for 2016 and 2017 will be about $75.7 billion — just less than the $76.3 billion for education, which has historically claimed the largest slice of pie. But those numbers are estimates, and conservatives say they expect actual health care appropriations to eclipse those for education once lawmakers pass their final budget. Critics say comparing Article II and Article III “all funds” spending — that is, state dollars plus federal dollars — is not a fair comparison because it leaves out the local taxes that fund public schools. State health care spending is also supplemented by significantly more federal money than education spending is. But fiscal conservatives say the comparison is significant because it points to rising health care costs over time. If "all funds" health care spending surpassed education, it would be a first. 4. Health agency consolidation might save money, but not much. Lawmakers this year will consider a recommendation put forth by the Sunset Commission to consolidate the state's five health agencies into one "mega agency." The recommendation's authors claimed the move would save about $6.2 million over the next two years, including layoffs of 32 full-time state employees. Expect lawmakers making the case for consolidation to cite those numbers. The legislative budget estimates don't include any assumptions about consolidation. But even if the state did save the $6.2 million championed by Sunset, in the grand scheme of health care spending, that's peanuts.